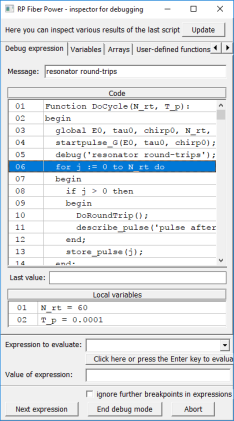 Ask RP Photonics for advice on what is the most suitable method of pulse generation in your case, and how exactly to implement it. Gain switching is a method for pulse generation by quickly modulating the laser gain via the pump power. If a high pump power is suddenly applied to a laser, laser emission sets in only with a certain delay, as it starts with weak fluorescence light, which first needs to be amplified in a number of resonator round trips. Therefore, some amount of energy can be stored in the gain medium, which is subsequently extracted in the form of a short pulse. The pulse obtained can be shorter than the pump pulse and also shorter than the upper-state lifetime; the dynamics are essentially as in the phenomenon of spiking, where the pump power is applied for a short enough time to generate only a first spike. The higher the pump pulse energy, the shorter is the pulse build-up time, and consequently the required pump pulse duration. 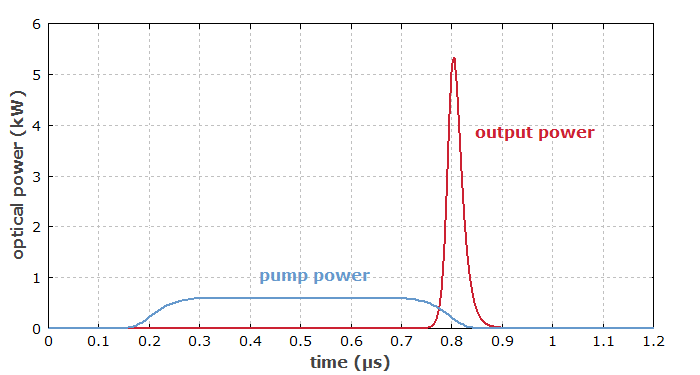 The pulse build-up time of a gain-switched laser can be increased by using a longer laser resonator, but this also increases the output pulse duration. The pump power may be completely switched off between the pulses, or may be kept at a level just below the laser threshold. Figure 1: Simulated power evolution for gain switching of a solid-state laser. The pump energy is so high that the laser pulse is emitted at the end of the pump pulse. For a higher pump energy, the laser pulse would start too early, and a second pulse may be emitted. Some gas lasers can be operated with a pulsed excitation current. This is often done with TEA carbon dioxide lasers (CO2 lasers), which are suitable only for pulsed operation. However, the result is not necessarily gain switching in the sense of using the first emitted spike; it may also be a kind of quasi-continuous-wave operation over a limited duration. In other cases, a pulsed laser is used for optically pumping a gain-switched laser. For example, nitrogen ultraviolet lasers or excimer lasers can be used for pulsed pumping of dye lasers. A solid-state bulk laser or fiber laser can emit a single spike if it is pumped only for up to a few microseconds. The pulse duration may be of the order of tens to hundreds of nanoseconds. That operation mode is rarely used, however, due to the limited pulse energy. It is also possible to operate a laser diode with short current pulses, or with a continuously modulated signal. This can lead to pulses with durations of a few nanosecond or even down to a few tens of picoseconds, and with pulse repetition rates up to several gigahertz, as used in telecom applications. With additional pulse compression, one can reduce the pulse durations further to below 4 ps . In contrast to mode-locked lasers, gain-switched laser diodes easily allow one to adjust the pulse repetition rate in a wide range, since it can be controlled with an electronic driver without changing the laser resonator setup. Also, they are simpler and more compact. However, the timing jitter and also fluctuations of other pulse parameters are larger than for a mode-locked laser. Subsequent pulses are not mutually coherent. The pulse energy of a gain-switched laser diode is fairly limited, since the peak power can usually not be much higher than for longer pulses. When trying to produce longer pulses with higher energy, the gain-switched peak can be disturbing, if one needs a smooth temporal pulse profile. An interesting approach to the generation of energetic nanosecond pulses is to combine a gain-switched laser diode with a fiber amplifier. In this way, pulses with microjoule or millijoule energies can be generated. This method provides a high flexibility in terms of pulse duration, shape and repetition rate. However, a rather high amplifier gain is needed due to the low seed pulse energy, and therefore one often requires more than one amplifier stage and additional optical filters for achieving sufficient suppression of amplified spontaneous emission. Gain-switched laser diodes may also be used as seed lasers for optical parametric amplifiers.